In 1933, the Kriegsmarine looked for a standardized shipboard reconnaissance aircraft. After a brief selection period, the Reichsluftfahrtministerium (German Air Ministry, RLM) decided on the Heinkel He 60 biplane. This was one of a line of developments of a basic biplane airframe that appeared as a number of floatplanes, trainers, and fighters. Deliveries started in a matter of months. By 1935, it was clear that the He 60's performance was lacking, and the RLM asked Heinkel to design its replacement. The result was the He 114. The first prototype was powered by the Daimler-Benz DB 600 inline engine, but it was clear that supplies of this engine would be limited, and the production versions turned to the BMW 132 radial engine instead. The plane proved to have only slightly better performance than the He 60, and its sea-handling was poor. Rushed modifications resulted in a series of nine prototypes in an attempt to solve some of the problems, but they didn't help much. The Navy gave up, and the planes were eventually sold off to Romania, Spain and Sweden. In October 1936, the RLM asked for a He 114 replacement. The only stipulations were that it would use the BMW 132, and they wanted prototypes in both twin-float and single-float configurations. Designs were received from Dornier, Gotha, Arado and Focke-Wulf. Heinkel declined to tender, thinking that the 114 could still be made to work. With the exception of the Arado design, they were all conventional biplanes. That gave the Arado better performance than any of the others, and the RLM ordered four prototypes. The RLM was also rather conservative by nature, so they also ordered two of the Focke-Wulf Fw 62 design as a backup. It quickly became clear that the Arado would work effectively, and only four prototypes of the Fw 62 were built. The Ar 196 prototypes were all delivered in summer 1937, V1 (which flew in May) and V2 with twin floats as A models, and V3 and V4 on a single float as B models. Both versions demonstrated excellent water handling, and there seemed to be little to decide one over the other. Since there was a possibility of the smaller outrigger floats on the B models 'digging in', the twin-float A model was ordered into production. A single additional prototype, V5, was produced in November 1938 to test final changes. The Ar 196C was a proposed aerodynamically-refined version. The Ar 196C project was cancelled in 1941. The plane was loved by its pilots, who found it handled well both in the air and on the water. With the loss of the German surface fleet the A-1s were added to coastal squadrons, and continued to fly reconnaissance missions and submarine hunts into late 1944. Two notable operations were the capture of HMS Seal, and the repeated interception of RAF Armstrong-Whitworth Whitley bombers. Although it was no match for a fighter, it was considerably better than its Allied counterparts, and generally considered the best of its class. 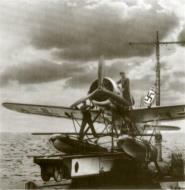 Owing to its good handling on water, the Finnish Air Force utilized Ar 196 solely on transporting and supplying special forces patrols behind enemy lines, landing on small lakes in remote areas. Several fully-equipped soldiers were carried in the fuselage. The first Arado Ar 196 to fall into allied hands was an example belonging to the German cruiser Admiral Hipper captured in Lyngstad by a Norwegian Marinens Flyvebaatfabrikk M.F.11 seaplane of the Trøndelag naval district on 8 April 1940, at the dawn of the Norwegian Campaign. After being towed to Kristiansund by the torpedo boat HNoMS Sild, it was used against its former owners, flying with Norwegian markings. At 0330 on April 18, the Arado was evacuated to the UK by a Royal Norwegian Navy Air Service pilot. The plane was shortly thereafter crashed by a British pilot while on transit to the Helensburgh naval air base for testing. At the end of the war, at least another Arado Ar 196 was left at a Norwegian airfield and kept in use as a liaison aircraft by the Royal Norwegian Air Force for a year on the West coast. Aircraft operated by Bulgarian Air Force is displayed at the Museum of Aviation and the Air Force, Plovdiv, Bulgaria. Aircraft formerly equipped the German cruiser Prinz Eugen is displayed at the National Air and Space Museum, USA. The Aircraft Historical Museum, Sola, Norway, has a fuselage frame that was raised from the wreck of the German cruiser Blücher. Ar 196A-5 - delivered from 3.43, improved radio equipment (FuG 16Z and FuG 25a, later supplanted by FuG 141), the flexibly-mounted MG 15 in the rear cockpit giving place to an MG 81Z (twin 7.9-mm MG 81s) with 2000 rounds.